The Islamic conquests were a huge blow to the Christian World, of the 5 Christian Patriarchates (the 5 great urban centers of Christianity in the 6th-7th centuries AD), 3 of them had been conquered by Islamic armies (Jerusalem, Alexandria, and Antioch), with only Rome and Constantinople still under Christian rule. The Christian World was at its weakest state since it was first adopted as the official religion of the Roman Empire. The newly created Islamic World by contrast was flourishing, having acquired many of the great urban centers of civilization. Islamic ruled cities such as Damascus, Baghdad, and Cordoba developed into centers of trade, learning, and culture. During the 9th Century AD, the Arabs took advantage of the weak state of the Christian world by building large navies and taking their armies to the seas. The Mediterranean Sea became a virtual Muslim lake, where "Saracen" raiders, as they became known, were able to strike anywhere they pleased, pillaging the land and raiding for slaves, with little fear of Christian reprisals. In fact, huge areas of the coasts of the Mediterranean were abandoned by Christian communities in wake of these raids. 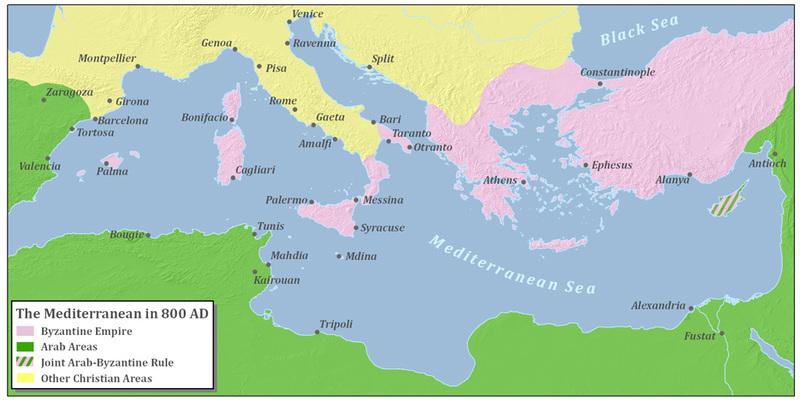 (See map 2 - 870 AD) The height of Muslim power over the Mediterranean Sea can be characterized as the mid-9th Century AD. This period saw Muslim armies cross the Mediterranean and capture the islands of Malta, Sicily, and Crete, and even areas of mainland Italy. The Southern Italian cities of Taranto (840-880 AD) and Bari (847-871 AD) were both captured and held by Muslim forces for much of the 9th Century. (See map 2 - 870 AD) One peculiarity of this period was the fate of Cyprus, where the Byzantine Empire agreed to "co-administer" the island with the Arabs, each party would take an equal share of the taxes collected. The arrangement lasted for some 300 years, despite the fact that in the same time there was nearly constant warfare between the two parties on the mainland. Towards the end of the 9th Century, the Christian World began to recover. The first successful counter-offensives were against Saracen strongholds on Mainland Italy. By 915 AD, all of mainland Italy was back in Christian hands and Italian city-states such as Pisa and Amalfi began to develop fleets that could defeat Saracen ships before they arrived on Christian shores. Whilst Christian forces had gotten the upper hand in Italy, Muslims were still able to operate their fleets from Spain and continue to raid the coasts of Southern France. Saracens established a stronghold along the coast of Provence at Freinet (Fraxinetum)and were able to control the surrounding area for almost 100 years before being finaly driven out in 973 AD. In 902 AD, Muslims from Spain conquered the Balearic Islands.